Except for accounts of journalists, dissident employees, and an occasional congressional committee focusing on crime and unethical practices, we have known very little about how television programs are produced. 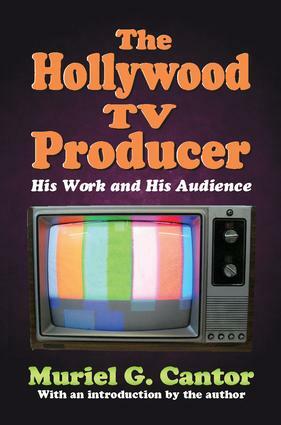 The Hollywood TV Producer, originally published in 1971, was the first serious examination of constraints, conflicts, and rewards in the daily lives of television producers. Its insights were important at the time and have not been challenged. Using as her framework the social system of mass communications, Muriel G. Cantor shows how producers select stories for television series and how movies end up in prime time. In order to get a comprehensive look at the inner workings of the TV industry and its producers, the author interviewed eighty producers in Hollywood over a two-season period. She probed to discover how the people producers work for and where they work influences their decision-making. As Cantor shows, critics of television who suggest that to remain in production, a producer must first please the business organization that finances his or her operations, are largely correct. Cantor shows that content is determined by a combination of artistic and professional factors, as well as social, economic, and political norms that have developed over time in the industry.